Why does it taste a little bland when you had tuna at high-class sushi restaurant? A Michelin Guide secret eater from the US?! Reevaluating the serious risk to health posed by farmed salmon! What is Red Snapper the same as “Tai” (Sea Bream)? Why do we use the counter “kan” for sushi? Do you know that there are rankings for negitoro (minced tuna)? Sushi chefs are also extremely particular about the salt they use. What is the difference between Kitamurasaki uni and Murasaki uni? Is Sushi made by a Master Really Transparent?! Some of the shari drops off of the sushi placed in front of you by the chef saying, “Sorry to keep you waiting.” You may be served this kind of nigiri sushi at restaurants that have lines out the door. Of course sushi that falls apart before it even touches your lips is a failure. Good nigiri sushi looks solid, but once you put it in your mouth the shari naturally loosens. Next the loosened rice absorbs the taste of the topping and it doesn’t stick to the roof of your mouth. On the other hand, with shari of sushi that has been pressed too strongly, the taste of the topping is left in your mouth, getting in the way of new flavors. In other words, the sushi looks hard on the outside, but it soft on the inside. This is the perfect recipe for sushi. When first learning, chefs are only concerned with shape and press the pieces too firmly. Next they let up on the force a bit and once they find the perfect amount of pressure, they become a real sushi chef. A master sushi chef is one rank above that and makes sushi that light can pass through. The sushi must be pressed gently enough for light to pass through, but firmly enough so that the sushi holds its shape. We hope this information will be helpful. Posted on August 28, 2017 September 11, 2018 Categories TriviaTags Edomae Shigoto, Nigiri sushi, Sushi IngredientsLeave a comment on Is Sushi made by a Master Really Transparent?! Is there a certain order for eating sushi? Generally, start by eating fish with a lighter flavor like white fish and move onto fish with a heavier flavor such as Toro, Uni, Japanese conger (Anago), and then Egg (Tamagoyaki). Finishing with Seaweed rolls at the end is a typical way. The following menu is an omakase style at one famous restaurant in Ginza. Begin with white fish? And Egg (Tamagoyaki) comes last, just along the general order. Perhaps the way this owner serves might have become common. To maximize each flavor of toppings, have some pickled ginger or hot tea between different types of sushi for cleansing your palate. You don’t really have to stick to the specific order, though. It seems like having customers eat freely is the idea held in common by most sushi chefs. However, it is true that you won’t be able to taste the next flavor after eating something rather sweet. Japanese conger (Anago), Egg (Tamagoyaki), and Kanpyoumaki should be eaten at the end. Posted on August 28, 2017 September 11, 2018 Categories Basic KnowledgeTags Nigiri sushi, Okimari, Omakase, Sushi etiquette, Table Manners, WashokuLeave a comment on Is there a certain order for eating sushi? Fish farming is to hatch fish from eggs or to raise from juvenile fish right after hatching. Imported fish farming tuna, which is out in the market now, is actually fish fattening tuna that is raised bigger by feeding to full-grown fish. Fish fattening is to catch tuna by fixed net fishing method when they are skinny after egg-laying, and to fatten by feeding wild fish such as sardine and mackerel for three months. Why is sushi so good for your health? The seafood used in creating sushi are very nutritious products. There has been particular research into the health benefits of Docosahexaenoic acid (DHA) and Eicosapentaenoic acid (EPA), which are present in the fat of fish. The vinegar used is also good for your health. It lowers blood pressure and helps relieve fatigue. And depending on the size of the sushi, a meal is only about 450 to 600 calories if you eat 10 pieces. It is a much healthier option when you compare it with the 600 calories in a 200g sirloin steak. Let’s take a closer look at the nutrients found in sushi and how you benefit from them. The essential fatty acid DHA is found in all fish and shellfish and has the effect of keeping the brain active and preventing aging. Fatty tuna contains a lot of calories, but it also has the most DHA of any sushi. EPA, another essential fatty acid, may lower cholesterol in the blood and reduce the neutral fat, helping with circulation. This is found in large quantities in silver-skinned fish, shad, horse mackerel, mackerel and sardines. Taurine is an amino acid, and a component that is present in almost all tissues of the body, but it is found particularly in crustaceans such as shellfish, shrimp and octopus. It has the effect of stabilizing blood pressure, preventing high blood pressure and arteriosclerosis, and lowering cholesterol levels in the blood. Vitamin A is abundant in sushi such as eel and urchin. It is said to improve eye function, preventing eye fatigue and stopping deteriorating vision. It may also improve the skin and mucous membranes, having an anti-aging effect. Some people say, to help prevent cancer, it is important to consume adequate amounts of vitamins A, C, E and dietary fiber. Vitamin A acts to suppress the growth of cancer. Vitamin C acts to suppress the production of carcinogenic substances. Vitamin E has the function of preventing senescence of somatic cells. It is thought that dietary fiber has the effect of cleaning the intestines and preventing colon cancer. As an example, sea urchin is rich in vitamin A, but at the same time it contains a lot of vitamin E useful for preventing aging. 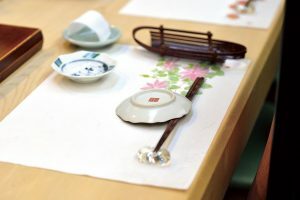 The green tea consumed when eating sushi contains Vitamin C, and the dried gourd (kampyo) at the end of the course contains plenty of dietary fiber. As you can see, sushi is not only delicious, it is also scientifically proven that it is good for health. Just be careful to not overeat sushi with too much fat content like fatty tuna, or pieces with a lot of sugar such as conger eel. Posted on August 21, 2017 Categories EdomaesushiTags Anago, DHA, Edomae Shigoto, EPA, Nigiri sushi, Sea urchin, Sushi Ingredients2 Comments on Why is sushi so good for your health? We went to Tsujiki wholesale fish market today also, and actually got to enter at the time all food professionals are buying and selling. The tuna auction begins at 5:00 am. Then about 6:30 am, intermediate wholesalers start lining up their winning bid tuna. Therefore, it is around the time when people like masters from sushi restaurants come to buy fish. Once professional deals settle down at 10:00 am, all the other visitors and foreign tourists are allowed to get in the market. What exactly is the difference between on what is going on before and after 10:00 am? That is how determined sellers and buyers are. It is entirely full of sprit because it is a place for exchanging valuable information. This is one situation I saw how they interact. As they talk about how Tuna, air transported from Boston, is fatty but doesn’t have any flavor of Tuna compared to the inshore ones, they let me try a piece. The one from inshore definitely tastes more as Tuna for sure. 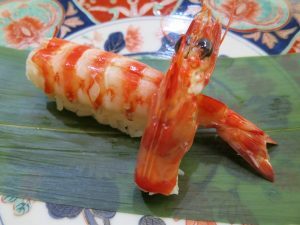 All about the Kuruma Prawn, a dish that has been around since Edo-style sushi was invented. Once you try it, you’ll never want any other shrimp. 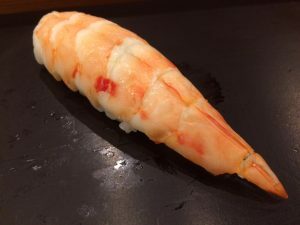 Cultured shrimp is imported to Japan from India, Vietnam, Indonesia, and other places and it used in a lot of nigiri sushi. The shrimp used in sushi rolls is generally the giant tiger prawn. It is used because the price is cheap and it becomes a beautiful vermilion color when boiled. Unfortunately, it doesn’t have the sweet taste normally associated with shrimp. 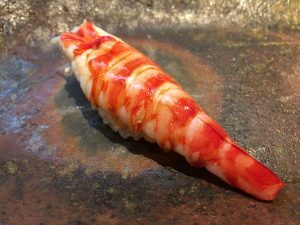 On the other hand, the Kuruma prawn that is offered at Edo-style sushi restaurants has a rich aroma and sweetness than spreads over your tongue. It is also becoming more popular to boil it just before serving it to the customers. By doing this, the warmth enhances the sweetness of the shrimp. The old Edo-style sushi restaurants will also ferment the shrimp in eggs scrambled with sweet vinegar (yolk soaked in vinegar) for several days. When the Kuruma prawn is soaked in the egg, its umami is enhanced and its pleasant acidity is delicious. By the way, when you boil the shrimp, it normally bends towards the belly. Crooked shrimp cannot be used for sushi, so a few cuts are made in the ventral to stop it from bending and it is cut along the muscles or from head to tail and skewered before boiling. You still have to be careful it doesn’t bend when you peel off the shell. Therefore, even just the way a Kuruma prawn is boiled demonstrates the skill of a sushi chef. 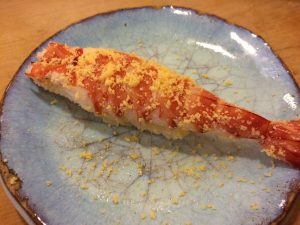 Posted on August 7, 2017 August 7, 2017 Categories EdomaesushiTags Edomae Shigoto, Kuruma prwan, Nigiri sushi, Sushi Ingredients3 Comments on All about the Kuruma Prawn, a dish that has been around since Edo-style sushi was invented. Once you try it, you’ll never want any other shrimp. Why is Zuke used for lean meat? 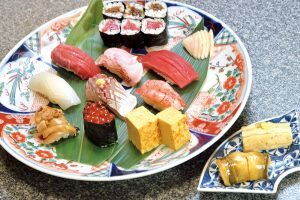 Zuke is one of the traditional Edo-style sushi methods. It is said that it was started in the Edo period to stop tuna from rotting when there were large amounts of the fish in the market. Now that there has been advances in refrigeration technology, it’s no longer necessary, but maturing the fish gives it a completely different taste and brings out its umami. Zuke is divided into two broad methods. Here we describe the characteristics of each. 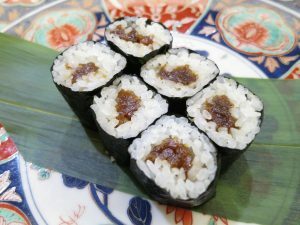 Recently, most sushi restaurants incorporate the “Single Zuke”. Each slice of tuna is soaked separately, so it can mature quickly. The immersion time is only a few minutes. The idea is to marinate just enough so that the tuna’s aroma remains and the soy sauce doesn’t overtake it. On the other hand, the old Edo-style method is to perform Zuke after parboiling. Parboiling means to wrap the fish in a wet cloth, and poor boiling water on the wrapping until the color of the tuna changes color, then turn the fish over and repeat the process. The fish is then put in ice water so the heat doesn’t go too deep in the meat. It is immediately removed once it cools so that it doesn’t get too watery. The tuna is then put in Zuke soy sauce and left to marinate for about half a day. In this method, the soy sauce only soaks into the surface part where the color changed from the parboiling, so the flavor of the tuna remains. Both methods keep the maximum tuna flavor possible. Tuna is an essential part of Edo-style sushi. There is great diversity between sushi restaurants in the parts, marinating time and flavor of Zuke, which creates a new, original flavor when the lean meat of the tuna soaks up the soy sauce. The fattiest cuts of tuna are most popular. 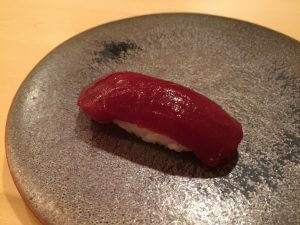 The lean meat has only become more popular due to a rekindled interest in zuke, but in fact during the peak of the bubble economy, there was a time when high-end restaurants in Ginza didn’t know what to do with all their leftover lean tuna meat. It’s almost unbelievable to think of it now. Posted on August 1, 2017 September 12, 2018 Categories Basic KnowledgeTags Edomae Shigoto, Maguro, Nigiri sushi, Nikiri, Sushi Ingredients, UmamiLeave a comment on Why is Zuke used for lean meat?